Evil alien jellies, the Wekas, have arrived to Earth. Their plan is to colonize our planet and subdue every form of life on it. But Waimanu, beside being only a little blue penguin, will fight the Wekas for the freedom of Earth inhabitants. Waimanu can push blocks and make them slide, and sliding blocks can squash Wekas between them. He can also destroy blocks if they cannot be pushed, for instance if they're already against to a wall or if there's another block behind them, but also Wekas can destroy blocks whenever they want, and try to reach our hero. The field borders can be also hit by Waimanu and they will vibrate for a second, stunning each Weka that is leaning to it. A stunned Weka can be eliminated simply by touching it, but beware because they recover consciousness quite fast! Finally, blocks containing hidden Wekas are highlighted at the beginning of each level, and they can be destroyed before they deliver the alien life form. Each level contains a different number of blocks and a different number of Wekas, but you've got a fixed amount of seconds (75 or 50, depending on difficulty level EASY/HARD that you selected when you started the game) to eliminate them, of they'll become faster and will eventually catch you easily, or they'll try to escape before you could eliminate them all, if only one Weka is left. Points are awarded for every second saved when you completely wipe Wekas from a level. Then 400 points are awarded for each Weka that is eliminated, and extra points are awarded when more that one Weka is squashed with the same sliding block. A small amount of points, 30, are awarded also for each destroyed block, and much more points are awarded for lining up all the three special 'Diamond' blocks (which are deployed in each level, they're also completely indestructible): if they line up against a wall, you'll be awarded 5,000 points, or 10,000 points if you're able to line them up with at least one of them not touching any wall. An extra life is awarded when reaching 10,000 points and, after that, another extra life will be awarded every 15,000 points. To push or break blocks, or to hit a wall and make it vibrate, you should press the A button. 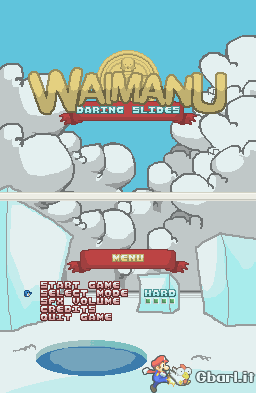 To help Waimanu in his battle for freedom, there could be bonus features of 5 different kinds randomly hidden inside the blocks. Let's see each one of them. Tsunami. An azure tile with a T on it. This will release a tsunami wave when Waimanu steps on it. The wave will make every alive Weka drown. It doesn't touch blocks or still hidden Wekas. Fire. A red tile with a F on it. This will heat the whole field with fire when Waimanu steps on it. Every alive Weka will be incinerated but this will also destroy a lot of blocks and will set free every Weka still hidden. Dynamite. A black tile with a D on it. This bonus can be collected and used when needed. It drops a bomb that will explode few seconds later, destroying everything around it. So be careful because even Waimanu could be hit by this. Hole. A green tile with a H on it. This bonus can also be collected and used when needed. It creates an hole on the field surface that cannot be seen by Wekas so they'll will fall if stepping on it. The hole is temporary and will last some seconds. Waimanu won't be able to pass over it, by the way, so beware. Block. A yellow tile with a B on it. This bonus can be collected and used when needed. It drops a block which is completely indestructible for few seconds, then it will become just like every other normal block. This could also be useful for lining up 'Diamond' blocks. When a bonus is collected, any previously collected but unused bonus will be lost, so only one bonus will be available at a time. Uncollected bonuses will disappear after just few seconds, so you need to be fast to decide if a bonus is worth a run to get it. To use a bonus (which means to drop a bomb, to make a block appear or to create a hole) you should press the B button. If you do this while Waimanu is moving, the bonus will be released behind him. Otherwise, if he's still, the bonus will be released the direction he's facing. The game can be paused/unpaused using the Start button. Closing the DS lid will also pause the music and enter powersave state. To completely defeat the alien invaders, Waimanu should eliminate them from each one of the 4 different areas where they are hiding. 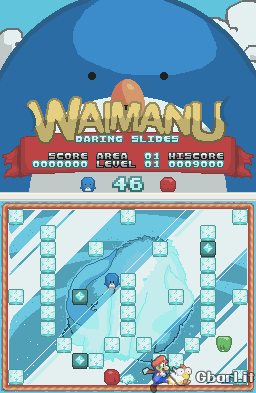 There are 8 different levels for each area with increasing number of Wekas, and they even get smarter as the battle goes on, so expect them to become more aggressive as they realize how much a little blue penguin can be a threat to their conquest plan. 'HARD' game mode is even available for those who find the challenge too simple in the standard 'EASY' mode. More Wekas for you to squash! Nel team ci sono The Dig, Mu Ho, e una vostra conoscenza: genecyst, l'autore di Holy Hell GBA. E il sottoscritto. Ah ecco, lo dicevo io che la grafica era troppo simile a HH, doveva esserci il suo zampino.